I chose the 42 km distance but ran the first loupe a little too quick,as experience should have reminded me that you only have so much gas in the tank, lesson learned but was quite happy to complete it. get while running long distances. many hours in +30c temps. Experience the very best of trail courses. The Limberlost Forest and Wildlife Reserve is the trail runner’s dream with its challenging terrain that will take you alongside pristine lakes, through a wetland with its tier of beaver dams, up and over some steep inclines and either tiptoeing or splashing through the occasional creek or mud hole. New York City is a mecca for museums, art galleries and shopping. While of course I was looking forward to these things (Nike Pegasus for $100 ?!! ), I also saw it as an opportunity to run in a new area. Running is such a great way to explore a city and Taus and I made sure to take advantage. Most morning runs were along the Hudson River as we were staying in the Soho/Little Italy area on Lower Manhattan, and as early as we could wake up on vacation to beat the heat and humidity. Saturday morning we ventured up to Central Park to join the New York Flyers Running Club (http://www.nyflyers.org/) for a scenic run on the Bridle Path through the park. They were an incredibly friendly and welcoming club and I’m happy they took us on a path we probably would have not found on our own. Our last run took us over the ‘famous’ Brooklyn Bridge where we snapped a few photos and enjoyed the views! To Rocks!! runners travelling to NYC in the future we highly recommend to do the above runs along the Hudson River boardwalk, the Brooklyn Bridge and Central Park. Also, check out Snug Harbor on Staten Island – we only walked this lovely area, but it would make for a great run. 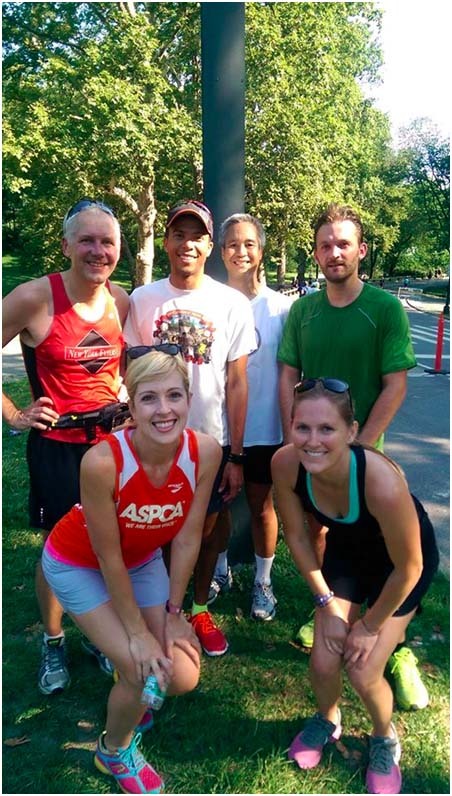 Finally, if you are looking for a local running perspective, be sure to check out the New York Flyers Club! Not sure how to interact with these strange aerobic creatures? Our FAQ will help. Summer is in full swing, which means that runners are, too. Perhaps you have glimpsed them out and about, loping along paths and trails. Maybe you’ve even seen them in suburban settings, such as supermarkets and coffeehouses, searching for food. But what do you really know about these shy aerobic creatures? Are they dangerous? What do they eat? How do you get rid of one that’s in your house? These questions aren’t academic. As the population grows, and more and more land is developed, human-runner interactions will only increase. The following information will help prepare you. Why do runners run? You might as well ask, “Why do birds fly?” or “Why do fish swim?” or “Why do people buy scratch-off lottery tickets?” The answer to all those questions is the same: Because it’s awesome. Also, in the case of running, because maybe you can lose a few pounds. Why do runners wear those crazy clothes? Scientists are unsure exactly what purpose is served by the skimpy and often brightly colored gear runners wear. One theory is that it’s meant to attract potential mates. Another is that it’s defensive, as it makes them more visible to motorists. Some biologists believe that runners have actually evolved to prefer brighter clothing, as those wearing dull colors like “Pavement Gray” tend to not live long enough to reproduce. Runners enjoy a varied diet, consisting of bananas, sports drinks, bagels, pizza, smoothies, beer, pasta, spareribs, chicken lo mein, muffins, scrambled eggs, sushi, ice cream, grilled shrimp skewers, black bean enchiladas, and those big turkey legs they sell at state fairs and Renaissance festivals. And that’s just on their long-run days. You might be tempted to feed runners—especially the skinny ones—but don’t do it. You’ll only attract more of them, and runners swarming in great numbers can be a nuisance. What should I do if I encounter a runner who’s lost and scared? From time to time, a runner may stray from his pack and find himself in unfamiliar territory, such as a sports bar or a dinner party full of extroverts. Often, he will appear agitated, or confused. Don’t panic! Runners can sense anxiety, and it will only make a bad situation worse. Instead, approach the runner and ask about his footwear or his watch. Both will likely be running-specific. Soon he will be talking about running, nonstop, which will put him at ease. This will buy you some time while someone phones the nearest specialty running store. The store will send someone to collect the runner and return him to safety. What if I find a runner in my house? Especially in the hot summer months, runners may seek relief in air-conditioned homes and then panic when they can’t get back out—especially once they realize that their GPS watch has lost its satellite connection. If you discover a runner stuck in your home, open a door and try to “shoo” her out with a broom. If that doesn’t work, try a little trickery. Pointing outside and shouting, “Hey! Isn’t that the guy who wrote “Born to Run”?” has been known to work. In short: No one knows. There’s much more, of course. Runners are complex, fascinating creatures, and they have much to teach us. I hope that this information helps ensure that your encounters with runners—this summer and beyond—are happy and healthy ones. Mark Remy is a writer at large for Runner’s World, author of The Runner’s Rule Book (Rodale, 2009), and creator of the popular Remy’s World column at RunnersWorld.com. He has run 27 marathons.